I’ve been debating with my brother and a few friends on this subject for the last few weeks. We all have our favorite, and our reasons for choosing them, but I think what we’re really asking is, who can accurately portray the sexist, misogynistic, abusive, incompetent liar in such a way that we end up laughing, even if just for a moment? To be able to laugh right now is priceless. With the ridiculous tax cut plan, the budget cuts, a potential nuclear war on the horizon, the danger that people of color, queer people, and immigrants are in, there isn’t a lot to laugh at. Except No. 45, of course. Now, I’m not comparing based on who has the more accurate portrayal, per se. I think that different people prefer specific talk show hosts for a variety of reasons, whether they were already watching them, or they share the same type of humor, or they happened to be watching a clip on YouTube and liked a certain sketch. 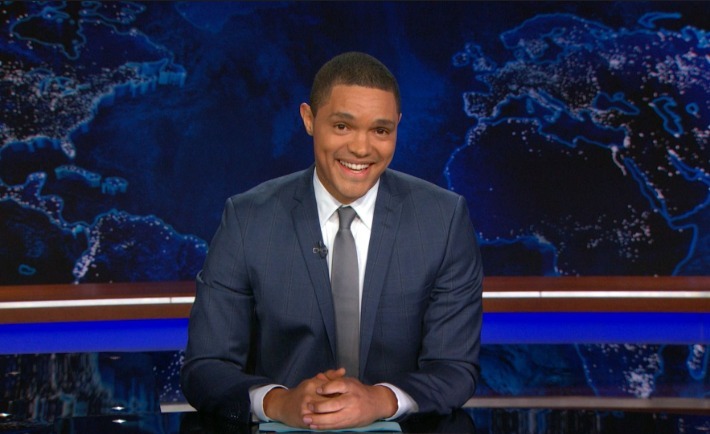 First, you have Trevor Noah, who dabbed a bit of orange on his face, donned a wig, and makes his voice hoarser. It’s pretty entertaining, especially because Trevor’s dry wit and Trump’s idiotic, bizarre claims pair so well. It’s the absurdity that makes me giggle. 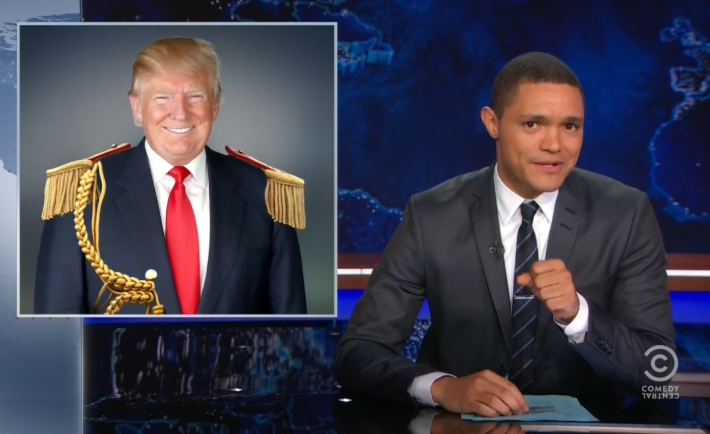 With the Daily Show, Trevor Noah has been able to reach a large audience, pulling them in with his intelligent dissection of the dumpster fire that is the United States currently. 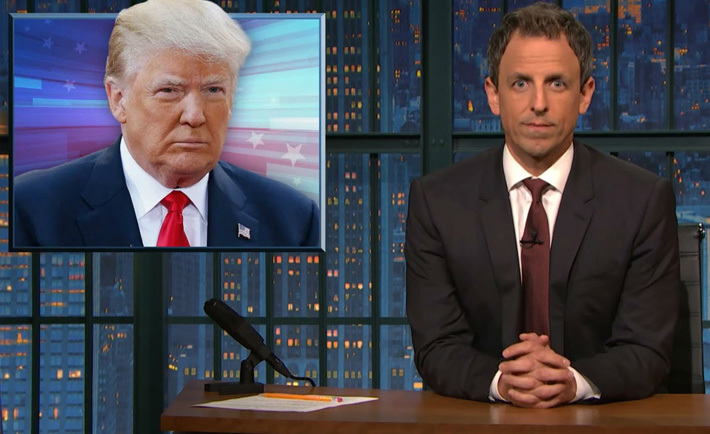 Lastly, Seth Meyers’ impression of Trump is my favorite. I don’t think it’s technically better than Trevor Noah’s or Stephen Colbert’s, but it makes me laugh the hardest. This might be because Seth goes all in — when he’s doing an impression, he pulls out all the stops. He goes overboard with the wordage because Trump is bombastic. He puts in a bit of urgency, a sense of melodramatic force that I believe carries the essence of Trump’s psyche: The narcissist’s fear of being found out. Whether you like one, two, or all three of these talk show hosts’ visions of No. 45, or whether you hate them and support a racist with ties to Nazis and the KKK, these three talk show hosts have all brought joy to our lives in a very dark place in history. They serve as the jesters of our time, calling out hypocrisy where they see it, and giving us something to think about without preaching at us. 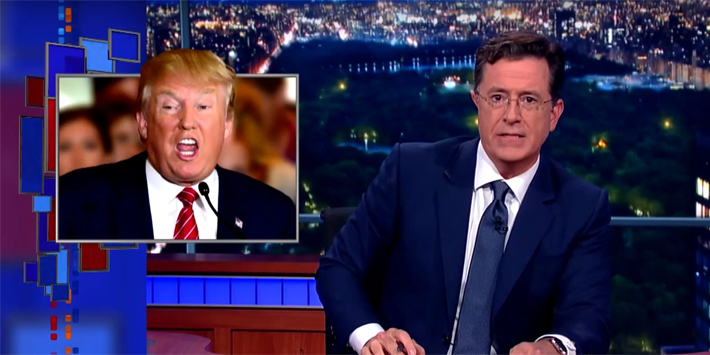 Thank goodness for men like Trevor Noah, Stephen Colbert, and Seth Meyers. There would be a lot more tears without them.